Sometimes, striking out on your own can be a grand adventure — but sometimes, it can leave you horribly lost and put a serious damper on your day. Getting out on a kayak and exploring the waterways around Key Largo is one of the best ways to see all our region has to offer, but we’ll readily admit that it can be a bit confusing at times. Do you want to explore the ocean, the Gulf, and inland canals by kayak? Let the Keys Skis and Adventure team be your guide to all the best spots! The options to explore the Upper Keys by water are bountiful. You can hop on a boat, rent jet skis, go parasailing, or myriad other options. So why a kayak? The answer may seem obvious in hindsight. A kayak can take you to some of the best spots that powered watercraft can’t get to. A kayak is a light, slim-skimming, and easy to maneuver option so you can work your way through narrow mangrove tunnels or get closer to the coral reefs than you would be able to otherwise. And, even better, they’re a great option for the whole family. A kayak is easy enough to paddle that most kids can steer their craft without help — though you’ll want to keep an eye out for splash wars between the kids! Our area of the Upper Keys has some truly spectacular sights to explore by kayak. We’re in a prime location to enjoy easy access to the Atlantic Ocean, the Gulf of Mexico, inland canals and waterways, and for the adventurous, the long string of formations that make up the Florida Keys as a whole. Many parts of the Keys and the southern tip of the peninsula are state parks, which help further protect the lands and keep them restricted to only certain watercraft — all to make your kayak adventures that much more enjoyable! Of course, there are so many great places to explore that there’s no way to see it all in an afternoon. This is where our two-hour kayak tours come in. Our semi-private tours are designed to take you out and give you an introduction to some of the best spots around Key Largo, focusing on several spots that are only accessible to kayaks and other shallow, non-powered crafts. We can take you into the mangrove tunnels, a formation unique to Southern Florida, and an experience you won’t want to miss. We can also show you around our reefs — the only living coral reefs in North America! Ask us about kayak rental options so you can grab your snorkel and spend some time taking in all the vibrant variety our reefs have to offer. Are you bringing the kids to Southern Florida for a family vacation? 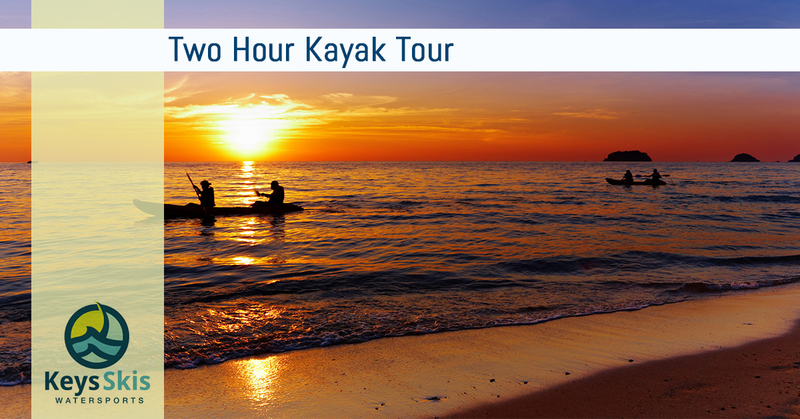 Definitely add kayaking to your to-do list! The kayaks we offer for rental are sit-on-top, meaning that if you happen to capsize, the worst that happens is you topple into the water and have to haul yourself back onto the kayak. If you need them, we also offer life vests, so even those who aren’t strong swimmers don’t have to worry about falling off their kayak. They’re also pretty easy to paddle and steer, so your older kids can each have a kayak to themselves. For questions about age restrictions or taking a younger child on a kayak tour, contact the Keys Skis and Adventures team and we can provide you with specifics. There are plenty of different options for exploring the waterways around Key Largo, but none so great as taking a kayak tour. We’ll take you around, show off some of our favorite locations, and make sure you don’t get lost in the mangrove tunnels. If you’re interested in just visiting the reefs or spending your entire tour touring the inland canals, let us know. We can work with you on different tour and kayak rental options to make sure you have the chance to see the areas that are most important to you. Contact the Keys Skis and Adventure team to learn more about our kayak tours and other ways to explore this beautiful part of Florida. Who knows? Maybe you’ll want to give parasailing a try next!